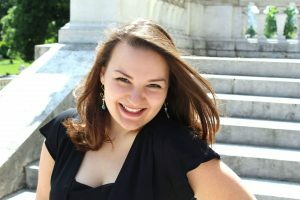 Juliette Chauvet (France, 1996) began her music studies at the age of five in the children’s choir of the Opéra d’Avignon under the direction of Maestro Stefano Visconti. In the meantime she starts learning the harp, the viola and the piano. In 2009, she combined the harp class of the Conservatory (CRR) de Lyon with singing in the Jeune chœur de Lyon under the direction of Xavier Olagne. In 2012 she moved to Paris to enter the choral conducting class of the Conservatoire de Paris (CRR), as well as Maîtrise de Paris (direction Patrick Marco) where she sang as soloist from 2012 to 2014. As singer she performed on many Parisian stages (Salle Pleyel, Théâtre du Chatêlet, Bouffes du Nord, ….) and in many lyrical festivals in France (Festival d’Auvers-sur-Oise, Annecy Classic Festival…) and abroad (Musikfest of Vienna, tour in Denmark…). Since September 2015 she studies with Sylvia Greenberg at the Musik und Kunst Universität in Vienna. She received a scholarship from the Vienna-Tel Aviv Vocal connection that allowed her to attend the Masterclass of Sylvia Greenberg and David Aronsson at the Chamber Music festival of Eilat (Israel). In August 2016, she received a scholarship from the Gstaad Vocal Academy (Gstaad, Switzerland) to work with Silvanna Bartoli. Juliette made her opera debuts with the roles of Barbarina (Le Nozze di Figaro) and Frasquita (Carmen) in 2016. Juliette also interprets contemporary creations from young compositors such as Rahi Sinaki, David Gottfried, Marinu Leccia. Juliette is member of the French Youth National Choir since September 2016, conducted by Filippo Maria Bressan.